Namesake - Frisbie Hall was named after Henry H. Cherry's youngest daughter, Josephine Frisbie Cherry born August 28, 1900. She earned a degree in physical-education from Sargent University in Boston, but after moving to Tulsa for her husband's job, "she simply switched by teaching women via newspaper how to keep their figures and looks." ["Why Grow Old? Writer her Own Best Ad," May 20, 1951] She continued writing until her death. She received as many as 2 million letters a year from her fans. She was a physical education director at Western for 3 ½ years before moving to Tulsa. Josephine Lowman died in 1983 at the age of 84. 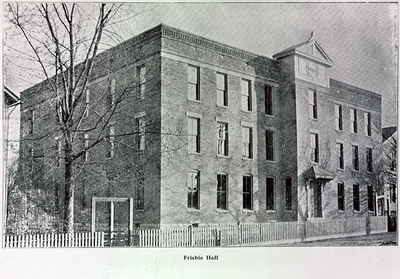 History - Frisbie Hall was a building used by the Southern Normal School & Business College as a women's dormitory. The three story brick building was built behind the original Vanmeter Hall on Center Street. The 48 rooms were carpeted and the building was heated by electricity and gas. Rooms rented for $3.00 to $4.50 per month. Frisbie Hall became the Earle Hotel after Western Kentucky State Normal School moved to the top of the hill. There is one project in Bowling Green that has been accomplished in the way of renewal -- a single urban renewal project -- that has brought exclamations of delight from many areas. . . .
Mason Hall is, so far as we can recollect, the first dormitory since the days of Frisbie, Bailey and Cherry halls for students frequenting the class rooms of "The Towers." These dormitories were operated under the direction of Dr. H.H. Cherry when the Southern Normal Schoo, the forerunner of Western, was flourishing at the present College of Commerce location. Frisbie Hall was the building which is now the Earle Hotel. Mrs. Frisbie, mother of Mrs. H.H. Cherry, was the matron. Other directors of Frisbie Hall in later years were Dr. and Mrs. A.C. Burton and Dr. and Mrs. R.P. Green. "A Safe and Pleasant Place for Girls and Young Women at School Away from Home," Course Catalog. Frisbie Hall, the Home for young women of the Normal, is a modern, up-to-date, three-story building. It has hot and cold baths, steam heating, electric lights, elegant parlors, and all modern improvements. It is being repaired, renovated, replastered, papered, floors painted, new shades placed upon the windows, new rugs on the floors, the entire building, from top to bottom, fumigated under the direction of the Secretary of State Board of Health. Quarterly inspection of hygenic conditions of rooms and building by the same eminent authority has been arranged. So everything which contributes to the convenience, pleasure, health, comfort of the girls has been done, making the building scientifically safe and sanitary. Prof. and Mrs. R.P. Green, who will have charge of superintending the Hall, will give time and attention to securing comfortable and pleasant conditions to those who are placed under their care and protection. Prof. and Mrs. Green are cultured and refined people, of mature thought, and will add an atmosphere of dignified refinement to the environment of the student's life. They will chaperone parties of girls on their outings and goings to and from church and Sunday school. They will superintend and regulate the social features of student life at the Hall and will assiduously endeavor to make all features of this complex Home pleasant and agreeable socially, and helpful educationally. No parents, who have daughters, need fear or hesitate to place them for care and guidance and protection into the hands of these superintendents, for the utmost diligence will be exerted to make the Hall home-like and render this pleasant and inviting hall an ideal home for young women away from their parents. Under this splendid and careful superintendency, and in this refined and moral atmosphere, for all these luxurious accommodations -- free baths, electric lights, steam heating, beautiful parlors, comfortable rooms and janitor service -- a very low rate is charged. The rooms are graded according to location and size, and range in price from three dollars to four dollars and fifty cents to each occupant per month. Meals in the school's boarding home are one dollar and fifty cents per week, and in private families one dollar and seventy-five cents and two dollars, and two dollars and twenty-five cents per week. So good board and room, excellently furnished, can be obtained for from nine dollars to eleven and twelve dollars per month, with accommodations unsurpassed.